Abstinence and indulgence, pleasure and pain. Each meal holds a microcosm of the world of desires. Brendan Connell has compiled a group of the most exquisite, the most transcendent, the most tortured masters of the culinary world for our reading pleasure. Lives of Notorious Cooks brings together 51 of the world’s greatest masters of cookery and in doing so also provides us a unique view of the antique world through its skillets, cleavers and stomachs. He prefaces the book with a mysterious caveat: This book may be fiction or may be fact. It is probably best not to cite this work in any essays intended as part of an academic history qualification. Enough said. The eras of the cooks range from one hundred years to four thousand or more years ago and they come from ancient Roman, Egyptian, Chinese, Japanese and English cultures among others. The portraits vary in length from one page tapas to full multi course eleven page feasts. The cooks themselves may come as grandiose divas who live theatrical lives and consume just as much as they cook, mountain dwelling ascetics who hesitate to cut vegetables too vigorously in honor of the plant’s Buddha nature, and some who are only mentioned briefly in their own stories. Regardless, Connell captures the tone of the times and places perfectly. Connell is a master of emulating the style of antiquated manuscripts perfectly with their particular language, oblique references and cultural idiosyncrasies. Each portrait is produced from what appear to be varying amounts of fact, speculation and extrapolation. If the (admittedly limited) fact checking I performed is any indication then Connell has done a noteworthy amount of research and has filled in the gaps with his warped and powerful imagination. His humor is bone dry, slipped in almost like an afterthought—though without losing any potency. Some jokes are reminiscent of the famous Spam sketch from Monthy Python’s Flying Circus and I found myself laughing out loud at more than a few of the stories. He wields repetition to great effect and often whips around and drops novelty right as you are settling into a common groove. The paranormal plays a role in many of the stories, with demons and goddesses popping up to little fanfare to help or hinder the cooks and in at least one case to become enchanted cookware. This combination of brevity and the supernatural had me at times feeling traces of Borges though the writing here is totally unique. One of the great pillars of the work is the dishes and recipes Connell describes. Playing with obscure delicacies and very probable (but probably impossible) dishes he serves us eight pound swallow tongue pies by the truckload, wormwood cakes and the moon (or so it seems…). The lists of ornate, luxurious and sometimes revolting dishes goes on and on and provides just as much entertainment as the stories themselves. Not only the foods but how much and how the dishes are prepared provide ample entertainment: feasts of absurd size and acts of grotesque overindulgence abound, living foods and dishes of mimicry are common. The stories did sometimes seem repetitive and Connell uses similar tricks from time to time. I initially took this as a fault in the work but came to feel after reading further that this is usually just a small humorous act on Connell’s part. The writing throughout is fantastic and as mentioned above Connell is an excellent mimic of the styles of the time. Of course if these styles do not resonate with you than appreciation the Lives of Notorious Cooks may be slightly limited. 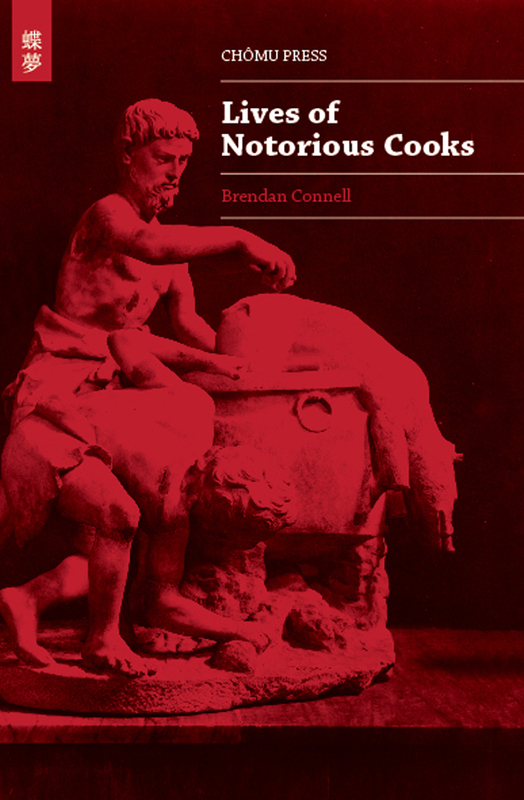 Purchase Lives of Notorious Cooks HERE. Reviewer bio: Sam Moss lives in the Pacific Northwest. He is currently working on a novel called Basic Analysis. He writes for the zine NADA at nadadadamagazine.blogspot.com and his blog can be found at perfidiousscript.blogspot.com.